The Nook Color is already an awesome little tablet, especially for those of us who have freed ours by rooting them. And with the most recent 1.2 update from Barnes & Noble, things got even better with the addition of Flash support and speed improvements brought on by Android 2.2 (Froyo). Unfortunately, a non-wonky root kit for 1.2 has yet to appear, so the only way to gain access to all that the Android community has to offer, including Google apps and the Android Market, has been to make major sacrifices in user experience. But what if you could actually make your Nook Color even better by completely replacing the Barnes & Noble software with a state-of-the-art Android install, giving you all the goodness of Android, without sacrificing any of the awesome ereader capabilities of the Nook Color (like access to magazine subscriptions - a particular sticking point for me)? Thankfully, now you can! Note: I have been informed that the interactive Nook Kids books don't yet work with the Android app, so if these are important to you, you might want to stick with stock Nook 1.2. Enter CyanogenMod, a build of Android that works beautifully on the Nook Color. 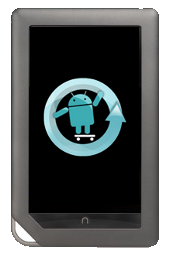 CyanogenMod is a custom build of Android 2.3 (Gingerbread) with a stellar user experience, including a number of enhancements that really shine on the Nook Color. And, when combined with yesterday's upgrade to Barnes & Noble's Nook app, you don't have to sacrifice any of the features of your Nook to enjoy all of CyanogenMod's Android goodness. Note: there is no risk in doing this - you can easily restore your Nook to stock Barnes & Noble software if you decide you don't like it. See Restoring your Nook Color to Stock 1.2 at the bottom of this post for instructions. Aside from a Nook Color, you'll need to pick up a microSD card and an appropriate adapter (like this one) so that you can plug it in to your computer. Most computers and laptops have an SDcard slot (often referred to as a Multi-card reader), but if yours doesn't, be sure to get a USB to SDCard adapter as well (like this one). USB to SDCard adapters may be a little tricky to find in stock at a local store - I've had the best luck at office supply stores like OfficeDepot and OfficeMax. Keep in mind that you'll be using the microSD card to store music, video, and pictures on, so be sure to select one that is of sufficient size (at least 1 gb). Note that an average, feature length movie (don't worry, I'll tell you just how to encode your own from a DVD below) will require about 800 Megabytes (roughly 0.8 Gigabytes) of space. Also, the setup process seems to work best if your Nook already has at least version 1.2 of the Barnes & Noble software on it. You can find out if you are running version 1.2 by tapping the up arrow, then Settings:Device Info. If you have 1.1 or earlier, you can either update your stock Nook Color using Barnes & Noble's instructions here, or you can update any Nook Color (stock or rooted) to 1.2 by following my instructions, Restoring your Nook Color to Stock 1.2 at the bottom of this post. Finally, make sure your Nook Color has a good charge before you get started. In fact, you might want to plug it in now while you work on the next part. Determine where the nook-cm7-install.zip file was saved when you downoaded it from the web site. Macs usually store downloaded files in the "Downloads" folder, which is in your home folder. Firefox often saves downloads in the Desktop. Move the nook-cm7-install.zip file to your home folder and double-click on it once to extract the nook-cm7-install.img file from the zip file. Once you have determined which device it is, type in the following: "sudo dd if=nook-cm7-install.img of=/dev/diskX" replacing the "diskX" with the disk number from step 8. When the command completes, your microSD card will be ready to go. Locate the zip file you just downloaded, right-click on it, and choose "Extract" to extract the application from the zip file. Do the same for the nook-cm7-install.zip file you downloaded earlier. Select the nook-cm7-install.img file you extracted above. Determine where the nook-cm7-install.zip file was saved when you downoaded it from the web site. It should be in the root of your Home folder. If not, move it there and double-click on it to unzip it. Finally, type in "sudo dd if=nook-cm7-install.img of=/dev/sdX" followed by the enter key, replacing the "sdX" with "sd"+the letter you determined in step 3. When the command completes, your microSD card will be ready to go. Now we'll boot the Nook Color off of the microSD card and install the software. To do this, we need to power it down, insert the microSD card, and power it back up. Hold down the power button and wait until the Nook offers you the option to shut down, then choose "OK" to shut it off. Then turn the nook over and open the "Nook" flap to insert your microSD card. Next, turn the Nook back over and hold down the power button for a few seconds (until you see the screen flash) to turn the Nook on. When done, press the power button to go back to the main menu, select "Wipe data/factory reset", and press the "n" button to select. Choose "Yes" to wipe data, and wait for the process to complete. Important: You MUST wipe data on your Nook Color, or it probably will not work correctly when you restart it, which means you'll have to come back and wipe data anyway. Trust me: wipe your data. When done, remove the microSD card and select "reboot system now", and press the "n" button to reboot. If your Nook Color is unresponsive, hold down the power button until it turns off, then power it up normally. At the bottom left corner you will find a few standard Android buttons, which are necessary to navigate. In order, they are menu, back, search, and notifications. The physical "n" button is still the home button. If you are new to Android, the menu button is of particular importance, as it is context sensitive, meaning what it shows changes depending on what you are looking at. Many new users find themselves lost and not knowing what to do next, because they forget that the menu button is there. A simple rule of thumb is this: when in doubt, try the menu button. Swiping left and right will bring up additional "pages" or "desktops" that you can place widgets or icons on. Press and hold with your finger on any blank space to add an icon or widget. Press and hold on an existing icon or widget to remove it. At the bottom center of the display, you will see a mini-dock with a phone, box of four smaller boxes (apps button), and a globe (web browser) The phone really doesn't do anything, since this isn't a phone, but you can replace it by press and hold, choose delete, press the apps button, and press+drag something else into its place. Go to the home screen (press the "n" button) and press the menu button (far-left on the bottom left corner). Tap "Settings" followed by "Wireless & networks", then "Wi Fi Settings" to select your wireless network. Follow the prompts to set up your connection. Once you are connected, press the "n" button to return to the home screen. Tap on the apps button on the home screen and open ROM Manager. Check the "Flash ClockworkMod Recovery" at the top of the list and make sure that it says "Current Recovery: ClockworkMod 3.0.2.8". If it doesn't, tap "Flash ClockworkMod Recover" and select "Nook Color" in the list that appears. Tap Download ROM, followed by Google Apps, then tap on the top-most entry in the list and tap Download. When the download is complete, you will be presented with a "ROM Pre-Installation" prompt. Don't change anything, just tap OK.
Press OK to Reboot and Install. If prompted by SuperUser about permissions, tap "Allow". Your Nook will reboot and install the Google apps all by itself. When complete, it will reboot again. The reboot will be a little slow this time, as it will rebuild the cache. You may be prompted with a list of Google apps. Be sure to select Market, YouTube, and any other Google apps you find interesting. If you aren't prompted, no worries, Market will be there and you can install any other apps you might want from there. Set the unhide button: When running a full-screen app, the button bar (menu, back, search, notifications) will add a fifth button, hide (represented by a couple of down arrows). CyanogenMod's default settings make it hard to get the button bar back when you hide it, so we'll want to change them. To do so, press the home button (the "n" button on your Nook), then the menu button (first button in the bottom left corner), and choose "Settings". Next tap "CyanogenMod Settings" followed by "Tablet Tweaks", then "Choose unhide button". Finally, choose "Home" from the list that appears. When you are done, you can press the home button to return to the main screen. Format your SD card: Many Android apps require a microSD card to work, so you'll want to be sure you have one in your Nook at all times. The problem is, if the card you want to use is the same one that you used to install CyanogenMod, then the recovery console will appear every time you reboot your Nook. To solve this problem, we'll want to erase the microSD card. To do this, insert the microSD card and press the home button (the "n" button on your Nook), then the menu button (first button in the bottom left corner), and then choose "Settings". Next press "Storage" followed by the "Erase SD Card" at the very top (under "SD Card"). Do not choose "Erase SD Card" under the "Additional storage: /mnt/emmc" heading, just the one under the "SD Card" heading. Make the Nook stay awake when plugged in: Default settings in this build of CyanogenMod set the Nook to go to sleep when it is plugged in. This can be a problem when you have it plugged into a computer and are copying files to/from it, as sleep will interrupt the process. To fix this, press the home button (the "n" button on your Nook), then the menu button (first button in the bottom left corner), and then choose "Settings". Next choose "Applications", then "Development" then check the "Stay Awake" checkbox. Install Flash Player: CyanogenMod doesn't have the latest Flash Player installed on it. Be sure to open the Market app, search for and install the Flash Player app. Once installed, Flash content on web pages and in apps should play properly. Install the Nook app: Like the Flash player, the Nook app is essential. Go find and install from the Market app on your Nook. Once installed, run the app and log in to your Barnes & Noble account. All your books and magazines will be there. Part 5 - Go get some apps! Media lovers should install the Amazon MP3 app, so that they can purchase and listen to songs on the go. And the one that every media-loving Android user should have is Doubletwist. Doubletwist is like iTunes for Android, including a desktop app for your Mac or PC and a player application for your Nook Color. The desktop app connects directly to your iTunes and iPhoto libraries, as well as any music/movie folders you might have and enables easy syncing of your content to your Nook Color. It will even automatically resize your un-protected videos prior to syncing (although there is a better way to deal with video below). And if you install the optional Airsync app on your Nook, you don't even have to plug it in to sync your content. Your Nook Color and Doubletwist app on your desktop will just find each other. Doubletwist also connects to Amazon's music store, so you can download all the music you might want directly. Last Step - Enjoy your newly liberated Nook Color! Update: For the truly adventurous, I have added an overclock kernel to the update that will boost the speed of your Nook Color from 800MHz to 1200MHz, with no discernible cost in battery life. To install it, follow the steps in Parts 1, 2, and 3 above and make sure everything is working. Then repeat the first six steps in Part 3, but instead of selecting "cm-7.1.0-RC0-encore-2.6.32-beta3.1.zip" in step 3, select "overclock-kernel-cm7-dalingren-2.6.32-emmc-051311.zip". Once your Nook Color reboots, you should notice a marked improvement in performance. Note: If you downloaded and installed this update prior to 5/22/11, the image file has been updated since you downloaded it. You will need to re-download and re-image your microSD to see the overclock kernel. Note: if you downloaded and installed the update prior to 6/1/11, you will need to re-download the updated image file and re-image your microSD card using the steps in parts 1 & 2 above before following these steps. Hold down the power button on your Nook and power it off. Then, insert the microSD card you imaged in Part 2, and power it back on. When done, press the power button to go back to the main menu, select "Wipe data/factory reset", and press the "n" button to select. Choose "Yes" to wipe data, and wait for the process to complete. Important: You MUST wipe data on your Nook Color, or it will not boot when you restart it, and will require a bunch of extra steps to recover. Trust me: wipe your data. When done, select "reboot system now", and press the "n" button to reboot. If your Nook Color is unresponsive, hold down the power button until it turns off, then power it up normally. Once your Nook has restarted, you'll be back to Barnes & Noble stock software. Note that it will operate as if it were brand new. You will have to re-register with Barnes and Noble and go through their setup process. Thanks for another update Jim. I have now updated all three of my Nooks. I did have issues with the section 4 instructions where it would download the GApps ROM but didn't actually install the ROM. No market or anything. At the beginning of the GApps section I ended up running the "Flash ClockworkMod Recovery" option at the top of the screen in the ROM manager and then selecting the Nook Color from the list. Once that was done all was well.I have also noticed that when I tried to download one of the interactive children's books, the new Nook App tells me that it is an invalid file type. After some research I found that the children's books are not yet supported on the Nook App. Not a problem for me at the moment but would be a problem for anyone that has purchased children's books created specifically for the Nook Color.Has anyone noticed their Nook Color becoming very sluggish after hours of use and have to reboot in order to get it to speed back up? I have had this happen multiple times now. It is fine after a reboot. All in all though, I am loving the Gingerbread version of my Nook! Thanks again Jim! Thanks Randy, I added an extra step to ensure people have the ClockworkMod Recovery flashed before they install Google Apps. Wasn't aware of the issue with the interactive books - added a note to the post as well. I haven't noticed any sluggish behavior over time, although it can be a little slow when it first wakes up from a "deep sleep" of more than an hour or so, as all the apps want to check for updates. Usually gets back up to speed within a minute or so. If you downloaded the image prior to Sunday, 5/22/11, you might also try updating to the latest build of CyanogenMod, which you can find under ROM_Manager:Download ROM:Dalingrin's Test Builds. The Beta 3.1 build might improve your wake from sleep performance. No, you don't have to root it first, that's what this actually does. No particular class or brand microSD card is required - should work with anything. Help! I've gotten the process started...successfully, so far...but, when I click on "Flash ClockworkMod Recovery," I'm told that: "The SD Card needs to be mounted to use ROM Manager." I tried putting the SD card back in the Nook, but I still got the same error message. Any suggestions? Thanks!! Hey Tonya - That was the error message I got when I first installed CM7. I started from step 3 (boot/recovery mode) and tried again. The second time, it worked perfectly. Thanks, Jim! I'm at work right now, but I will try that as soon as I get home. Should I restart the process at Part 3 and then leave the SD card in (instead of taking it out after wiping the data in Part 3, step 5) so that I can erase it just before Part 4?Thanks SO much for your patience with all my questions. This is my first time trying anything like this! Thanks for replying, Sabeen! After your advice, I've tried restarting at step 3 twice now, and I still get the same two errors (the pop-up about android.process.media and then also the notification that the SD card needs to be mounted to use ROM Manager. I don't know what I'm doing wrong! :( I've tried googling to see if others have had the same problem; I found one other user saying she had the same problem with ROM Manager and it was due to her wireless. I did notice that my wireless was already set up (even though I cleared my data). Could that be a problem? I found your clear instructions for replacing the OS on the Nook, but am a bit more cautious. I've read that I can put Gingerbread on an uSD card and it will boot and not wipe the default Nook OS on the uSD onboard - this seems a good thing for getting started. I've also read that what make uSD card one uses makes a difference (Class-10 are not all equal it appears).Do you have any opinions about this approach and any knowledge of which uSD cards would be good? A quick Google Search showed Froyo instructions, but not Gingerbread instructions. I couldn't find anything direct on cards with good records in a Nook Color.Thanks. @Tonya Try erasing the card before running ROM Manager. Go to home by pressing the "n" button, then tap the menu button and tap "Settings". Next, tap Storage, then "Erase SD Card" in the top "SD Card" section. @Mike - When you install the Nook app, it will ask you to register. @Tonya - the card has to be in the Nook to erase it. Try starting over from the very beginning by reflashing your Nook to Barnes & Noble stock software, then re-apply the updates. To do this:Re-download the nook-cm7-install.zip to make absolutely certain you have the latest version, and follow all the steps in Parts 1 & 2 to create a bootable microSD card with the latest and greatest version.Next, on your computer download update-nc-stock-1.2-keepcwm-signed.zip (stock Barnes & Noble Nook 1.2 software image file) and copy it onto the microSD cardFollow all the steps in Part 3 above, but instead of choosing "cm-7.1.0-RC0-encore-2.6.32-beta3.1.zip" in step 3, choose "update-nc-stoock-1.2-keepcwm-signed.zip"Once your Nook reboots, it will be completely stock, just like it was when you got it out of the box for the first time. You can then retry the CyanogenMod install. @JimM - There really is no risk, as you can see from my instructions to Tonya, you can easily put the Nook back if you decide you don't like it. @Mike - No, the overclock is just the kernel. You can, however, install them both in the same session. Just do the CyanogenMod first, then the overclock, and then wipe data. On reboot, you'll have it all. @Mike - No, softkeys is now unnecessary. CyanogenMod knows you have a Nook and adds its own on-screen softkeys for you. The problem I've encountered is that the standard android buttons are missing. Are they hidden or is there a problem with the way I followed your instructions or with the hardware. If they are hidden, how do I unhide them? I've reinstalled the program 7 or 8 times. I also followed your instructions to reinstall the original os but that didn't fully install as I encountered a problem with the keyboard flashing up and disappearing before I could use it. Suggestions? @Jack - Do you mean the menu, back, and search buttons? The settings for those are in Settings:CyanogenMod:Tablet tweaks. If you are referring to the dockbar at the bottom of the home screen, settings are in Settings:ADWLauncher@Mike - There are a number of Android guides out there. There's a pretty good beginners guide at http://hemorrdroids.net/beginners-guide-to-android/ PC world did a 40 tips & tricks article here. There's also the official Google Blog. CyanogenMod is fairly stock Android 2.3 (Gingerbread), so most any Android guide will apply. @Irene - Interesting. Haven't looked at digital editions for a while, but can see how it might get confused. I'll look into it. @Jack - Sounds like something just didn't take. I'd try restore to stock (instructions above) and redo. If it fails again, only thing I can think of is bad flash in the device. Thanks, this was extremely helpful. Only thing is now I don't have access to the B&N OS, so my pc doesn't recognize the Nook any longer, just the SD card. Is there a way to keep cyanogenmod and B&N OS (like with Froyo). Right now I can't transfer books on Adobe Digital Editions since it's not recognizing a nook device. Thanks again. Jim,Thank you for the excellent posts. Last night I updated my rooted NC version 1.0.1 to 1.1.0 to 1.2.0 as well as Cyanogenmod and everthing went flawlessly. This morning, after charging all night which I do most nights, to my surprise the NC was still charging and was only at 23% full and so far today it has not gone any higher. Have you ever came across this situation before? Do you have any suggestions on how I can remedy this situation?Thanks again for the great blog!Scott Q. Is there any reason I can't insert the SD card in my NOOK, format it, and then transfer the files / create the image on it after connecting the NOOK to my PC with a USB cable, rather than using the adapter? Please Note: This post is now obsolete. All of my Nook Color resources can now be found on my Nook Color Resources pages under Wiki Pages (to the right). Sounds like something didn't take. You shouldn't see the word color flashing at all, which leads me to believe that the old software is still on there. Try to redo the process by holding the power button down until it turns off, then boot from the microsd and follow the image steps. Be sure to watch for any error messages - could be that your microsd needs to be rebuilt. I have followed your instructions,... I thought, implicitly! Yet when I put the micro sd in my nook color and power up,..it just boots up normally in the barnes & noble mode and adds files to my sd card. I can read my sd card from the nook just fine and it shows the cm-7.1.0-encore-signed.zip file with a large red qustion mark on it as well as a, mlo, u-boot.bin, uImage, and uRamdisk files also with big red question marks on them. Do I need to unzip the cm-7.1.0-encore-signed.zip file on my microsd card before I load it into my nook color?